It's pretty clear that BitDefender doesn't see the distinction between the needs of a small office and the needs of an enterprise. 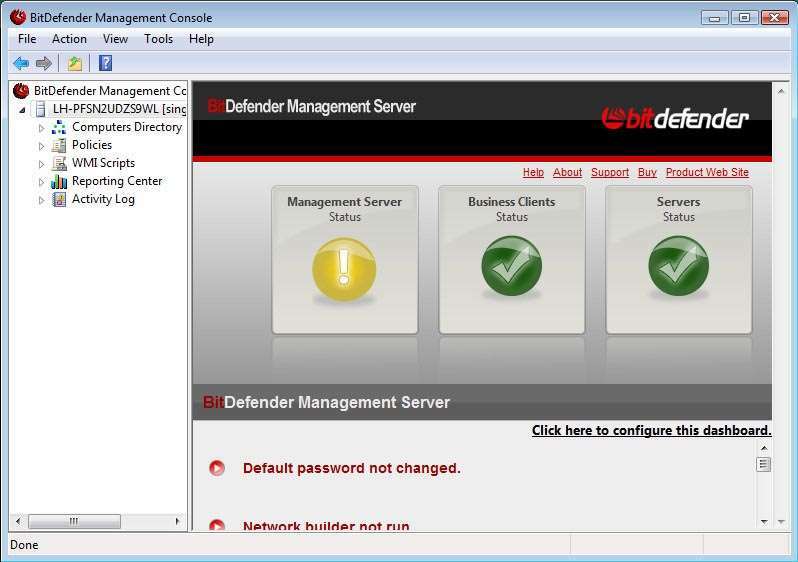 BitDefender Small Office Security is a powerful tool, integrating with directory services if available and deployable quickly across a large number of PCs. But it's also very complicated, requiring technical skills well beyond the capacity of many small office managers. Essentially what we have here is an enterprise-class product with a small business label. That has its advantages, but it makes it a little hard to recommend to less technical users. The easiest way to set up Small Office Security is to install the base package on a chosen server. This installs the management console (which can also be accessed from any PC that can see the server) as well as a tool for creating deployment packages; that is, customised executable files to be run on client PCs. For most small business without directory services, this can then be shared on the company file server or walked from PC to PC. The client agent is certainly one of the most powerful you'll find in a small business product. There's not much that appears in the consumer version of the BitDefender Internet Security that you won't find here. That includes anti-virus, client-side anti-spyware, anti-spam, firewall, anti-phishing and even parental controls. The client also incorporates detailed traffic measurement and reporting tools and a level of configurability that's almost unrivalled. The manager can set the client interface to be visible or invisible to the end user. The management console is rather intimidating at first. Using a Microsoft management console style administration tool, it can be challenging to find, group and manage individual PCs. With a little practice it's clear how much power the console provides, but it's not nearly as user-friendly as say, McAfee or Sophos' similar solutions. Perhaps the most extraordinary thing about the BitDefender application is the price. As with its consumer products, BitDefender is happy to massively undercut its competitors, being less than half the cost of several comparable solutions. For a product so rich in features, this is quite amazing - but BitDefender would be well served to make the solution a little easier to use as well.